332 pages | 128 B/W Illus. 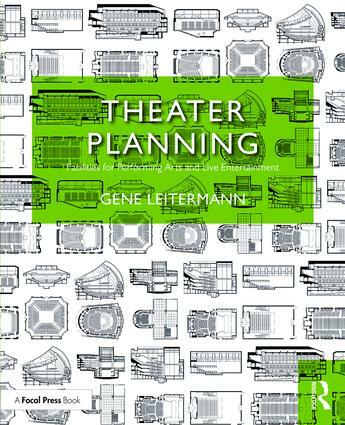 This book introduces theater planning to students and practitioners of each field, and provides a detailed guide to the process and the technical requirements particular to theater buildings. Part I is a guide to the concepts and practices of architecture and construction, as applied to performing arts buildings. Part II is a guide to the design of performing arts buildings, with detailed descriptions of the unique requirements of these buildings. Each concept is illustrated with line drawings and examples from the author’s extensive professional practice. Gene Leitermann is co-founder of Nextstage Design, a theater design consulting firm with a national practice. He has been the lead theater designer on more than 100 buildings. A faculty member at Yale School of Drama since 1998, Gene has also lectured internationally. He has provided public testimony, code change proposals, and written commentary to the National Fire Protection Association, International Code Council, and United States Access Board. Gene is a member of the American Society of Theatre Consultants (ASTC).